Carolina Beach and Kure Beach, NC, also known as Pleasure Island, offer pristine uncrowded beaches, sparking surf, quality family activities, affordable accommodations, watersports, fishing, shopping, delicious fresh seafood, and Southern charm. Carolina Beach and Kure Beach are very popular with visitors, residents, and newcomers seeking a quaint yet thriving beach town. Just a 30 minute drive from historic downtown Wilmington, this laid-back friendly island offers relaxation, miles of sandy beaches, and events and festivals to keep you entertained all year long. Slip on your flip-flops, grab your sunglasses, and prepare to enjoy all this area has to offer. From music festivals and chower and seafood festivals to spectacular fourth of July and New Year's Eve celebrations, there is something for everyone on Pleasure Island. Separated from the mainland by the Intracoastal Waterway, your worries start to melt away as soon as you cross the Snow's Cut bridge to get to Pleasure Island. As you cross the bridge, you'll see Carolina Beach State Park below you to your right. One of the few state parks in the region, Carolina Beach State Park is a great place to camp and enjoy the wonders of coastal nature. At the park you'll find six miles of trails, including the beautiful Sugarloaf Trail, which insiders know is a great trail to jog or walk, with or without your dog. Be sure to look for native Venus flytraps along your way. Because of the dense vegetation, campsites in the park have a great deal of privacy and are sheltered from the ocean winds. The park has a newly renovated 54-slip marina with gas and diesel fuel and two launching ramps. Watersports and fishing fans love this area as it is minutes away from the Cape Fear River, Masonboro Sound, and the Atlantic Ocean. Carolina Beach boasts one of the last remaining beach boardwalks on the East Coast, which has been completely revitalized to include a new family amusement park. A stroll down the boardwalk reveals everything you need for a day of fun. An old-fashioned arcade, ice cream shops, fudge shops, plenty of beach-inspired souvenirs, and Britt's Donuts, probably the best donut you've ever tasted. On weekends during the summer, the boardwalk becomes an amusement park that reminds you of days gone by. Bring the kids, ride the rides, eat cotton candy, and stay for the fireworks, all while breathing in the salty ocean breeze. During the day, come to the boardwalk and rent a Surrey or Deuce Coupe from Wheel Fun Rentals for a family outing. Or stop by the Wheel Fun Rentals at the Carolina Beach Lake Park and rent paddleboats and kayaks to spend a day paddling on the lake. The beachfront motels, including several vintage motor courts, offer a welcome blast from the past. You'll find hotels, motels, and bed and breakfasts here for every price range and for every type of vacation — from a family getaway to a special romantic honeymoon. A vacation at Carolina Beach is sure to rejuvenate, with its daily dose of salt water, fresh air, and time in the sun. Carolina Beach is a great spot to get married. Tie the knot on the beach and then walk with your wedding party to one of the many locations of a reception, including Havana's Fresh Island Seafood or the Ocean Grill and Tiki Bar. Pleasure Island is teeming with events and festivals all year long. Starting every May, you'll find weekly fireworks on the beach, a Saturday farmer's market, weekly family movies at Carolina Beach Lake Park, and a regular summer concert series. Annual events like the Beach Music Festival, the Chowder Cook-Off, and the Seafood, Blues, and Jazz Festival draw visitors from all over. No one does the holidays like Pleasure Island, and the annual Island of Lights Festival includes a Christmas Parade, a Holiday Flotilla, and the Island of Lights New Year's Eve Countdown. Whether you're looking for the daily fresh catch or a platter of fried seafood, restaurants in the area tempt every palate and price range. Look to sample fresh local seafood at restaurants along the beach, including the Surf House Cafe and Michael's Seafood Restaurant and Catering. Kure Beach to the south is overwhelmingly residential, dotted with modest cottages, new upscale houses and a number of beach motels. Several condominium buildings cluster together in one area, but there are few tall buildings. At the center of town, a popular fishing pier extends 712 feet out over the ocean and there are several fine restaurants. A charming boardwalk with benches extends north along the beach and is lighted at night. 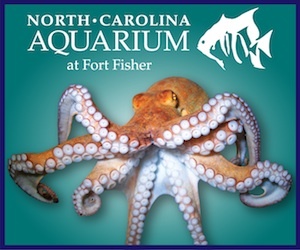 Don't miss the enormously popular North Carolina Aquarium at Fort Fisher, which is fun for young and old alike. The Fort Fisher State Historic Site offers a fascinating glimpse into the area's Civil War history and their annual re-enactment offers excitement for all ages. The Fort Fisher State Recration Area is a great place to explore miles of unspoiled beaches, complete with bathhouse showers, a visitor's center, and a concession stand where you can get ice cream for the whole family. With so much to see and do, how could you not enjoy your stay? One North Lake Park Blvd.